Want to increase your brain power at work? Try starting with your stomach. That’s the message of leading Canadian dietitian and best-selling author Liz Pearson, who emphasizes that the foods you eat have a direct impact on your energy and productivity levels. In particular, mid-day food choices can make or break a person’s afternoon productivity levels, she says. “We often hear that a good breakfast contributes to how well we feel and perform in the morning, but what is less known is that we also need to refuel our bodies at lunchtime to make it through the afternoon in top form,” says Pearson, co-author of Ultimate Foods for Ultimate Health. Pearson points to research that shows that one in five Canadians say they don’t have time for lunch or skip it entirely. Nearly one-third indicate they forget to eat lunch and one-quarter say they are too busy working to eat a mid-day meal. ”If you’re going to commit to making one change toward a healthier lifestyle this year, bringing a balanced lunch to work can really make a difference,” she suggests, adding that this will also help avoid the all-too-familiar trap of eating fast foods on the go. For ultimate energy and nutrition, Pearson emphasizes that every lunch should include a source of protein combined with whole grains, and topped off with fruits and vegetables. “Protein gives your lunch more staying power by helping you feel fuller and more satisfied for a longer period of time, and whole grains are important for the carbohydrates they provide, which is the main source of fuel for the body and brain,” she says. “Choosing whole grains, rather than refined grains, is particularly important since whole grains digest more slowly and help sustain a person’s energy over a longer period of time,” she explains, adding that whole grains are also linked to a lower risk of many diseases, such as cancer and diabetes. Chili, marinated bean salads, hummus or dips complete with whole grain bread or crackers. Loaded with nutrition and fibre, beans and legumes – an excellent alternative to meat – should be added to pasta dishes, salads, sandwich wraps or soups for maximum energy, Pearson recommends. Whole grain pasta salads of all types, infused with protein and vegetables. Search cookbooks or the Internet for creative pasta ideas. A good place to start is www.wholegrainpasta.ca for a wide range of recipes. Remember that pasta left over from the night before, such as spaghetti or lasagna, makes a nourishing lunch as well. Sandwiches made with something other than regular bread and loaded with veggies. Spice up your lunchtime routine by rotating between a variety of whole grain choices, including bagels, flatbreads, pita breads or wraps. Avoid processed meats like cold cuts, Pearson says, as they’re linked to a higher risk of colon cancer. Mashed or sliced avocado is a healthier alternative to mayonnaise. Alternating protein choices throughout the week. Excellent lunch options are leftover steak or chicken, seeds or nuts, hard-boiled eggs, and canned fish like tuna or salmon. If opting for canned fish, choose lower sodium varieties. Salmon is rich in the omega-3 fats and light tuna contains less mercury than white or albacore tuna. A meal-size salad, complete with protein and at least one dark green and one orange vegetable (such as dark leafy greens or broccoli and carrots) to help meet daily needs for vitamin A and folate. Pack light or lower fat – but not fat-free – dressing on the side. Our bodies need some fat to absorb valuable nutrients found in vegetables and fruits, says Pearson. 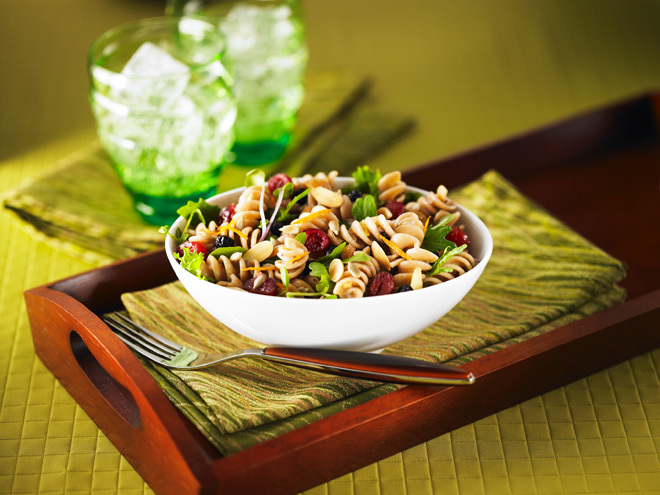 Combine salad with whole grain pasta and nuts or seeds for a unique-tasting, balanced meal (see Rotini Honey Ginger Mixed Greens Pasta Salad recipe below) . “The secret to ensuring that you stick to a healthy lunchtime routine all year round is to make your lunch the night before or prepare batches of pasta salad, soup or chili on weekends to enjoy all week long,” Pearson emphasizes. “Mornings tend to be hectic in most households, so set yourself up for success and avoid leaving this important task until the last minute by planning ahead.” And you can bet that by regularly consuming balanced, energy-infused lunches, you’ll have more stamina to do so, she says. This delicious and nutritious cold pasta salad is the perfect take-to-work lunchbox alternative to the traditional tuna sandwich. With a fresh taste and creamy texture, it’s packed with fibre, folate, vitamin C and iron. Pack some in your kids’ lunchboxes too. They’ll love it as much as you do! Prepare the bows according to package directions; add the peas during the last minute. Drain well. Meanwhile, whisk the yogurt with the olive oil, lemon juice, lemon zest, mustard, honey, garlic, salt and pepper. Toss the drained bows and peas with the dressing mixture, tuna, orange pepper, mint and onion until well combined. Season with additional cracked black pepper to taste. Serve warm or cold. Tip: Substitute 1 cup (250 mL) lima beans or edamame for the peas. Per Serving (about 1 2/3 cup/400 mL): 347 calories, 9 g fat, 2 g saturated fat, 22 mg cholesterol, 339 mg sodium, 49 g carbohydrates, 7 g fibre, 21 g protein. Excellent source of folate, vitamin C and iron. Cook rotini according to package directions. Drain and rinse under cold running water until cool; drain well and reserve. Meanwhile, place the dried fruit in a heat-proof bowl. Pour boiling water over top and let stand for 5 minutes. Drain well and reserve fruit. Whisk the orange juice with the vinegar, shallot, ginger, honey, orange zest, garlic, mustard, salt and pepper. Whisking constantly, drizzle in the olive oil. Toss the rotini with the leafy greens, reserved dried fruit, almonds and sunflower seeds. Add dressing and toss to coat. Tips: For extra flavour, use a salad blend that includes fresh herbs as well as leafy greens. If making ahead, hold back a little dressing to moisten salad just before serving. Notes: Dried blueberries can often be found in the produce department or at bulk food stores. Per Serving (about 1 3/4 cup/425 mL): 444 calories, 20 g fat, 1.6 g saturated fat, 0 mg cholesterol, 205 mg sodium, 61 g carbohydrates, 8 g fibre, 10 g protein. Excellent source of vitamin A, folate, thiamin and iron. Good source of vitamin C.
Bursting with colour and flavour, this heart-healthy pasta dish is loaded with fibre, antioxidants and good nutrition, including iron and vitamins A, B and C. Perfect for lunch, it also makes a terrific dinner – served hot or cold. Meanwhile, heat oil in a large, deep nonstick skillet set over medium heat. Add the tomato and red pepper; sauté for 5 minutes or softened. Tip: Garnish with a little shredded cheddar cheese. Per Serving (about 2 cups/500 mL): 386 calories, 7 g fat, 1 g saturated fat, 0 mg cholesterol, 399 mg sodium, 67 g carbohydrates, 14 g fibre, 16 g protein. Excellent source of vitamin A, thiamin, riboflavin, folate, vitamin C and iron. Good source of niacin. Source of calcium.